ROMANS 12:2 KJV "And be not conformed to this world: but be ye transformed by the renewing of your mind, that ye may prove..."
1I beseech you therefore, brethren, by the mercies of God, that ye present your bodies a living sacrifice, holy, acceptable unto God, which is your reasonable service. 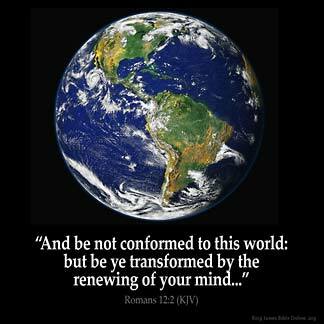 2And be not conformed to this world: but be ye transformed by the renewing of your mind, that ye may prove what is that good, and acceptable, and perfect, will of God. 3For I say, through the grace given unto me, to every man that is among you, not to think of himself more highly than he ought to think; but to think soberly, according as God hath dealt to every man the measure of faith. 4For as we have many members in one body, and all members have not the same office: 5So we, being many, are one body in Christ, and every one members one of another. And bee not conformed to this world: but be ye transformed by the renuing of your minde, that ye may proue what is that good, that acceptable and perfect will of God. And let not your behaviour be like that of this world, but be changed and made new in mind, so that by experience you may have knowledge of the good and pleasing and complete purpose of God. And nyle ye be confourmyd to this world, but be ye reformed in newnesse of youre wit, that ye preue which is the wille of God, good, and wel plesynge, and parfit. and be not conformed to this age, but be transformed by the renewing of your mind, for your proving what [is] the will of God -- the good, and acceptable, and perfect. 12:2 And be not conformed - Neither in judgment, spirit, nor behaviour. To this world - Which, neglecting the will of God, entirely follows its own. That ye may prove - Know by sure trial; which is easily done by him who has thus presented himself to God. What is that good, and acceptable, and perfect will of God - The will of God is here to be understood of all the preceptive part of Christianity, which is in itself so excellently good, so acceptable to God, and so perfective of our natures. Ro 12:2 And be not conformed to this world. The spirit of the world is opposed to that of Christ. Satan is "the Prince of this world (Joh 12:31 14:30 16:11). Christ died "to deliver us from this present wicked world" (Ga 1:4). Hence the service of Christ renders necessary a refusal to fashion ourselves after its ways. But be ye transformed. Instead of following the ways of the world, the Christian must be "transformed", changed into a new form of life by the renewing of your mind, by having a new spirit, and "walking after the Spirit" (Ro 8:1,4 Ga 5:16,25). That ye may prove. Demonstrate, show forth. The saint, transformed, renewed, will show forth in his life "the will of God". Changing the way we think and be Jesus alike,guided by the spirit and not depending to our own understanding. This is the first information that a Christian should know and he must learn to transform his mind before he becomes a grownup Christian.